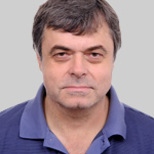 Sergey Strokan is a journalist, essayist and a poet. He is also a political commentator with Russia's “Kommersant” Publishing House. Mr. Strokan hosts “Red Line”, a weekly analytical program broadcast by The Voice of Russia in New York City. He is the author of three poetry collections, a winner of the Maximilian Voloshin International Literary Award (2010) and a member of Union of Russian Writers. 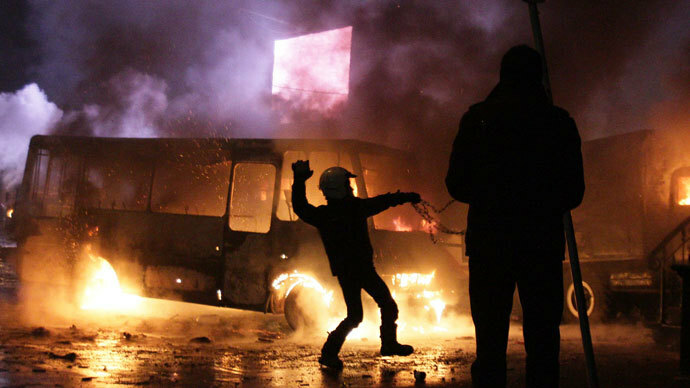 Protests in Ukraine, turning more violent day by day, are rapidly spreading from Kiev to the most populous and traditionally trouble-free industrial regions. The new reality may come as a shock for the West, which has applauded “brave and democratically-minded Ukrainians” and their “velvet revolution” – already the second in the last ten years. As the Euromaidan (Independence Square) movement went into a third month, its magic ‘revolutionary velvet’ has seemingly been worn out. 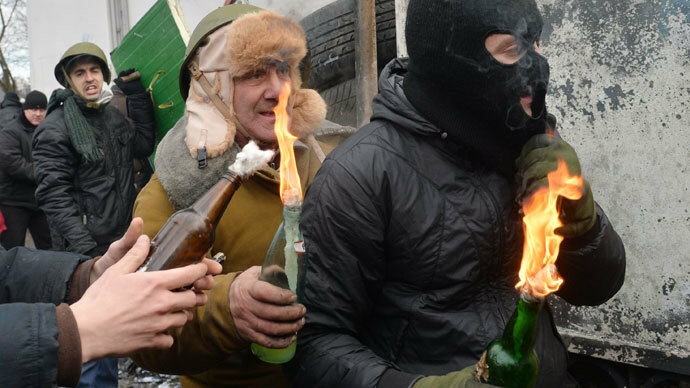 Molotov cocktails, gunshots and medieval-age catapult to fire at police, hastily erected at the streets of Kiev, along with the seizure of government buildings, including the Ministry of Justice, show that Ukrainian peaceful protests have already been hijacked by a new enigmatic force. But who are these grim-faced people in helmets and camouflage at the streets of Kiev, armed with stones and batons, very determined and hardly controlled by anyone? Meet the new breed of Ukrainian revolutionaries – ‘Pravy Sektor’ (Right Sector) radical movement, which has recently announced it is breaking away from the mainstream Maidan opposition crowd with its moderate leaders and decided to act on its own. Initially, Pravy Sektor members were calling themselves ‘the Maidan self-defense force’, which was assigned by the main trio of opposition leaders – Vitaly Klitschko, Arseny Yatsenyuk and Oleg Tyagnibok to provide the security of peaceful protestors and repel any attempt of the Berkut riot police to remove protestors’ tents and disperse the crowd from the Ukrainian capital’s main square. The core of Pravy sektor is made of the activists of radical groups, including ‘Trizub’, ‘Patriot of Ukraine’, as well as UNA-UNSO and the ‘Svoboda’ (Freedom) ultra-right party, which made international headlines after winning nearly 10 percent of votes at the last parliamentary election in Ukraine. The icon of the modern Ukrainian nationalist movement is Stepan Bandera – the notorious leader of the previous generation of Ukrainian nationalists who were fiercely fighting against the Soviet army during the Second World War. Gangs of cutthroats, obsessed with the idea of a unified Ukrainian state were hiding in the thick forests of Western Ukraine and hobnobbing with fascist Germany in an attempt to find a ‘senior brother’ to defeat the ‘Soviet occupants’. Bandera, who was killed by a Soviet spy agent in 1959 while living in exile in post-war Munich, was later proclaimed ‘a martyr’ and a ‘national hero’ by the offspring of the founding fathers of the Ukrainian ultra-right movement. Yanukovich, allegedly ceding Ukrainian sovereignty to Moscow, is seen by them as a traitor, one who would not hesitate to bury the sovereign Ukrainian state which was born after the decades of struggle for independence and by now has already seen 23 years of existence. These days, as key opposition leaders are holding one session of grueling negotiations with President Yanukovich after another in an attempt to find non-violent compromise and consensus, impatient Pravy Sektor mobsters are moving from one Ukrainian city to another, staging attacks on local administrations offices and calling on Ukraine to “wake up” and protest. They are trying to capitalize on popular discontent and make the whole Ukraine one big battleground for independence, as they understand the concept of an independent Ukrainian state. Radical nationalism is a dark, blind force, isn’t it? So this is how they can eventually set their whole native land, worshipped by them, on fire. And this is how a disciplined Maidan self-defense force member has turned into a blood-thirsty werewolf under the Ukrainian Moon. The recent Ukrainian turmoil has put Ukraine’s Pravy Sektor on the world map of radical groups and movements not fitting into the political process in their countries, and by no means sharing the values of democracy and respect for human rights, as advocated by Euromaidan activists. What comes as a double surprise is the latest news that ambassadors of several EU-member states, the US and Canada have paid another visit to Maidan to meet Pravy Sektor activists and learn how ‘the headquarters of national resistance’ operates. Instead of unequivocally condemning the rise of violent Ukrainian nationalism, which could turn the land of 45 million people in the very heart of Central Europe into another Yugoslavia (if not another Syria), the West has seemingly missed the point in Ukrainian crisis. It is only threatening beleaguered President Yanukovich with sanctions, as if at this point he poses the main danger to Ukrainian democracy, while turning a blind eye to the Pravy Sektor threat – not imaginary, but real. President Yanukovich and democracy make uneasy bedfellows, no doubt about that. However, by dancing with Ukrainian radicals, seasoned US and EU diplomats can send Ukrainian radicals the wrong message: embolden them, make them feel like the West shares their beliefs and is ready to throw its weight to support them against the ‘Moscow puppet regime’. So, since no one in Washington and Brussels needs another hotbed of turmoil near the EU’s borders, jeopardizing its security and economic interests, the rise of Pravy Sektor should come as a wake-up call for the West in its Ukrainian strategy, which by now seems to be a complete mess. Better late than never.